Hailed the highlight of the season, Michał Kwieciński's Jutro idziemy do kina / We Are Going to the Cinema Tomorrow owes its success largely to the screenplay written by Jerzy Stefan Stawiński, one of the best ever scriptwriters in Polish cinema and the co-founder - with Andrzej Wajda and Andrzej Munk - of the 'Polish School' of filmmaking. Stawiński, who had earlier written the screenplays of Kanał / Canal (dir. Andrzej Wajda, 1957), Eroica (1957) and Zezowate szczęście / Bad Luck (1960) (both directed Andrzej Munk), was instrumental (alongside Aleksander Ścibor-Rylski) in sparking off the rebellion of scriptwriters in the 1960s. His debut in independent filmmaking, the comedy Rozwodów nie będzie / No More Divorces (1963), belongs to the core of Polish cinema. Stawiński is also the writer of two major World War II films, Akcja pod Arsenałem / Operation Arsenal (dir. Jan Łomnicki, 1977) and Godzina "W" / "W" Hour (dir. Janusz Morgenstern, 1979), as well as of Pułkownik Kwiatkowski / Colonel Kwiatkowski (dir. Kazimierz Kutz), which was recognized as the crowning achievement of the "Polish school of filmmaking" in 1995. Another success factor was the involvement of the team which had made Andrzej Wajda's Academy Award nominated Katyń (2007) a few months prior, including Michał Kwieciński, the award-winning theatre and film director and a leading Polish producer who managed the production of Katyń, as well as Wajda's set designer Magdalena Dipont and costume designers Magdalena Biedrzycka and Andrzej Szenajch, (all three earned a mention at the Polish Film Festival in Gdynia). But the film's main strength lies in the select cast which includes Mateusz Damięcki (Andrzej), Antoni Pawlicki (Piotr), Jakub Wojciechowski (Jerzy) as well as Anna Gzyra (Krysia), Marta Ścisłowicz (Ania) and Julia Pietrucha (Zosia) - the latter won a prize in Gdynia for her part. The young actors act with vigorous enthusiasm and credibility, blurring the differences between contemporary twenty-year-olds and those from the 1930s and giving the film a thoroughly contemporary perspective rather than one from two generations ago. Here is Warsaw in 1938. Three friends from one of the top secondary schools - Andrzej, Piotr and Jerzy - end their education and after the graduation ball need to choose a future. Jerzy, who wants to put off his decision, enrolls with the cadet school in Zegrze. True to his family tradition, Andrzej joins the cavalry school in Grudziądz, while Piotr, who is unfit for military service, enrolls as a student of medicine. The boys meet when on pass and, collectively and individually, try to cross the threshold of adulthood through first loves or serious relationships. But grand politics stands increasingly in the way of their savouring of life, the world getting to the edge of the war within a year of the boys' graduation. Andrzej, in love with a local governor's daughter who is a student in Lvov, arranges a date with her for 6th September 1939. Jerzy gets close to desertion on 31st August in order to take his girlfriend, Krysia, to the cinema the following day. Piotr takes his beloved Zosia to the sea and on 1st September 1939 they can see the German bomber planes flying towards Gdynia. World War II has begun. Jutro idziemy do kina can be regarded as a continuation of the "Polish school of filmmaking", partly due to the script writer, but more so because it helps the audience realize that the iconic "Columbuses Born 1920" (the term borrowed from the title of Roman Bratny's novel and often used to refer to the young Home Army soldiers who fought to liberate Poland from Nazi occupation) were peers of contemporary twenty-year-olds - and happened to take their school-leaving exams a couple of years before the war. Compelling and highly credible, Jutro idziemy do kina sparked off some heated debates on the ever-present Polish questions of how responsible and ready for self-sacrifice in defence of the highest values is our youth. But the film was also popular abroad, winning top awards at the Shanghai and La Rochelle festivals as well as a photography prize for Piotr Wójtowicz. Jutro idziemy do kina / Tomorrow we are going to the movies, Poland 2007. Director: Michał Kwieciński, writer: Jerzy Stefan Stawiński, photography: Piotr Wojtowicz, music: Misha Hairulin, art director: Magdalena Dipont, costumer designer: Magdalena Biedrzycka, Andrzej Szenajch, editing: Milenia Fiedler, sound: Katarzyna Dzida-Hamela, Leszek Freund. 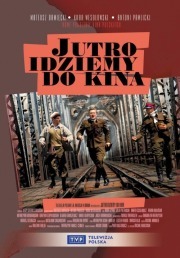 Starring: Mateusz Damięcki (Andrzej), Antoni Pawlicki (Piotr), Jakub Wojciechowski (Jerzy), Anna Gzyra (Krysia), Marta Ścisłowicz (Ania), Julia Pietrucha (Zosia), Maria Niklińska (Basia), Bożena Adamek (Piotr's mother), Krzysztof Stelmaszyk (Ania's father), Grażyna Szapołowska (Krysia's mother). Produced by Akson Studio, Telewizja Polska - Agencja Filmowa. Duration: 85 min. Premiered on 1st September 2007. 2008 - Hollywood Eagle Award for Michał Kwieciński at the Polish Film Festival in Los Angeles; Golden Magnolia in the TV Film Category for "a very realistic presentation of the loss of innocence due to war and of friendship which can survive at a time of crisis" for Michał Kwieciński at the Shanghai Television Festival; Best European Fiction Film Award at the La Rochelle International TV Production Festival; Photography Award for Piotr Wojtowicz at the Seoul Drama Festival; Television Feature Film Award for Michał Kwieciński at Prix Europa in Berlin; Photography Award for Piotr Wojtowicz at the Moscow International War Film Festival; Direction Award for Michał Kwieciński at the Bar International Television Film Festival.